Ken Stuck, seated, of In Home Services, tells discusses his company with an attendee at PA CareerLink's recent job fair at CPI. Employers around the county are looking for quality employees. You see it all over the county — businesses with “Help Wanted” signs looking for workers. On the radio, you hear ads from companies offering signing bonuses for the right people to join their teams. Open interviews are advertised in newspapers and online, as places look to bring in workers. The numbers show that this is a growing issue nationwide and in Centre County. According to the Central Pennsylvania Workforce Development Corporation, Centre County’s unemployment rate is 2.9 percent based on numbers from August. The regional and statewide unemployment rate is 4.1 percent, and the national rate is 3.9 percent. While it is a good problem to have fewer people unemployed, it does leave businesses with a smaller pool of job seekers looking for open positions. The labor force has decreased by 2,500 individuals in the past year due to 300 fewer workers and 2,100 fewer jobseekers, according to the CPWDC. Many businesses are trying to draw workers in with recruitment efforts. Some businesses are reducing minimum qualification requirements, raising wages to be more competitive, offering sign-on bonuses and reimbursement of relocation costs and expanding hiring of older workers, persons with disabilities and new college graduates without experience. And, employers are really struggling to find employees with the necessary skills needed for their jobs, according to the CPWDC. These include hard skills and competencies related to their open positions. Furthermore, employers also are having a difficult time finding employees with necessary soft skills such as critical thinking, good written and verbal communication and teamwork. Every industry has been impacted and is having challenges finding employees, but the CPWDC has heard the most feedback from health care and other skilled trades industries, such as manufacturing and construction. 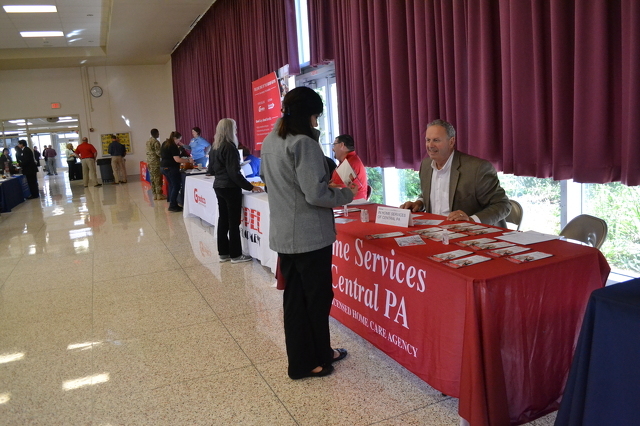 This was evident at the PA CareerLink job fair held at the Central Pennsylvania Institute of Science and Technology in Pleasant Gap on Oct. 18. With 50 businesses from around the county looking to find employees, health care and manufacturing industries were well represented. “I think businesses just aren’t seeing as many applicants, and there are so many people looking to have positions filled,” said Ken Stuck. He is the CEO of In Home Services, a home care agency in Centre, Huntingdon, Mifflin and Juniata counties. He said in order to keep and maintain employees, his company really strives to be a good place for them to have careers. Stuck said his company has raised wages, offered sign-on bonuses and worked to improve training, all in an effort to get and maintain employees. And, while these efforts have helped his business stay well-filled with workers who are happy in their jobs, he still goes to career fairs looking for employees, just to stay ahead of things. Goodco Mechanical is struggling to find workers for trade and office positions. Lynn said the company has high standards, but it is will to train the right kind of employee. In order to bring in the right candidates, the company is offering bonuses to current employees if they bring in new employees and it has looked at helping people relocate to the area to work. The career fair was a good fit for CPI, because many of the school's students are being trained with the skills employers are seeking. Skilled trade industries include those which hire workers typically trained at career and technology secondary and post-secondary institutions, and from CPWDC’s discussions with administrators of these technical schools, there continues to be a high demand for their graduates. Students in some fields of study, such as welding and machining, often are placed immediately, and some employers report there are not enough graduates to meet demand. In fact, there are projected to be more than 8,000 openings for production occupations, including welders and machining workers, over the next three years, according to the CPWDC. In the health care industry, there are not enough spaces in post-secondary education to keep up with the demand for registered nurses, partly due to the fact that nursing professors are required to have a doctorate degree, but few nurses pursue one, according to the CPWDC. The CPWDC's statistics indicate the problem will continue in the future, with older workers retiring and 80 percent of all new jobs requiring less than a four-year degree. The Chamber of Business and Industry of Centre County has heard the same kind of concerns from county businesses and said the issue is part of nationwide trend of employees who are not prepared to enter the workforce. These soft skill include work ethic, tactfulness and manners, team work, written, verbal and interpersonal communications, critical thinking/problem solving and understanding supervision in the world of work. The CBICC recently launched the CentreREADY initiative in partnership with all five Centre County public school districts, CPI and South Hills School of Business and Technology in order to connect local employers with individuals who are gaining proficiency in these areas and to provide access to a quality workforce. The CPDWC is tackling the issue head-on as well, with a variety of programs that will join with business-led partnerships looking to grow and strengthen the industries in the region. CPWDC currently is working with health care leaders to coordinate a meeting with K-12 and post-secondary educators to see how they can work together to increase the number of students who are entering the health care field and graduating with necessary skills. PA CareerLink, with its office at the Match Factory in Bellefonte, offers programming for high school students and young adults to learn about career pathway opportunities in various industries through industry tours, job shadowing, employer panels and paid work opportunities. Additionally, PA CareerLink and CPWDC staff work to inform parents and educators about workforce trends. Among other things, the CPWDC is working on a website that will enhance student, parent and teacher awareness of quality career opportunities in the region, with the main functionality being a searchable registry that matches students and educators with local businesses offering career experiences, such as tours, internships, speaker events and "Educator in the Workplace" tours. The website also will include information about career pathways and the local labor market.